Concerned family members may wonder what pungent—and to the uninitiated perhaps unpleasant—aroma has taken residence in your kitchen this month. It's the unmistakably potent scent that many cheese aficionados know and love because it virtually shouts “Limburger.” When you opened your box of cheese this month you probably noticed the scent right away. We won't try to dress it up—this is a STINKY CHEESE and one that often polarizes people. Truth be told, this is a cheese that folks either love or love to hate! Limburger is what is known as a "washed-rind" cheese, meaning that it is quite literally washed by hand. 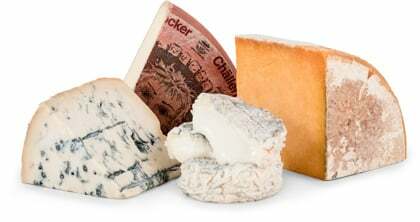 The young cheese is constantly washed or "rubbed" with a brine solution that stops the growth of mold while simultaneously promoting the growth of edible bacterium linens. This bacterium, known in short as “b-linens,” is where the astounding aroma comes from. It also creates the burnt-orange-colored rind. Limburger originated in the Belgian province of Liège and was first sold at markets in Limbourg; hence the name. However, in the 1800s cheesemakers in Germany fell in love with Limburger, and these days they are so captivated with it that most Germans—and even some Belgians—believe Limburger to be a German cheese. In the United States, Limburger also owes its popularity to the German-Americans who started making the cheese when they immigrated. Please, don't be put off by the aroma, or the fact that you normally don't enjoy Limburger. 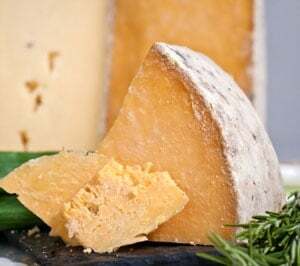 As is often the case in the States, folks who have predetermined what kind of cheese they enjoy (and those they do not) have come to such conclusions based on having tasted locally available, grocery-bought, factory-made cheeses. Our gourmet, international, farmhouse made cheeses are acquired via painstaking searching. They are selected because they represent the finest that their style has to offer—made with traditional methods and the finest ingredients. Fortunately, most club members join not just for the cheeses but for the adventure. Enjoy! Once you remove Limburger from the rind— the source of its potent power— this cheese is actually quite delicate in flavor. (The rind is edible, by the way, but it will make the flavor of your Limburger much stronger; so Limburger with the rind is not for the faint of heart.) The smooth, sticky, washed rind is reddish-brown with corrugated ridges. The yellow interior hints at sweetness, but the taste is predominantly spicy and aromatic. The intriguing sweet undertone of this cheese is a bona fide treasure when you get beyond the smell. Good accompaniments are fish cooked with onions and butter; or crackers, fruits, and vegetables. Serve it with plenty of German, or German-style, beer.